Castleford Tigers have strengthened their backroom staff with the appointment of Stuart Wilkinson as a new academy assistant coach to link up with the club ahead of the 2015 season. Wilkinson brings a wealth of experience to the role, having previously been on the coaching staff at Leeds Rhinos and Wigan Warriors. He said: “I’m really excited about joining such a talented, honest and hard-working coaching team at Castleford Tigers. “I had no hesitation accepting Pete Riding’s offer as I’ve worked with a number of his staff over the years. “Teaming up with Daryl Powell and Ryan Sheridan, who I worked with at Leeds Rhinos, and Danny Orr from my time at Wigan Warriors, will add to my experience. Pete has a massive amount of experience which he’s consistently proved over the years. “The area has a tradition of producing some of the best players in the game and being part of their system provides an exciting challenge to me. 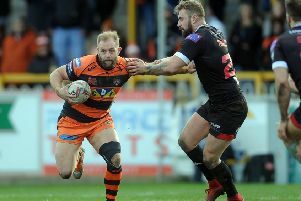 Tigers’ head of youth Pete Riding said: “Stuart has developed his trade under some very good coaches at some very successful clubs and we’re looking forward to what he will bring to the Tigers. “He’s very well thought of within the game and has got a lot of experience as a coach, so the input he’ll have into the culture here will be invaluable.